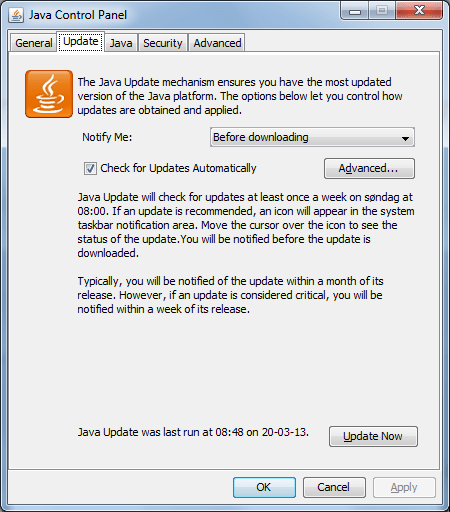 Over the past months I have been hearing more and more complaints, about the frequency of Java updates being too often, hence beginning to annoy more and more people. I wasn’t quite there yet, but given time I got annoyed too. 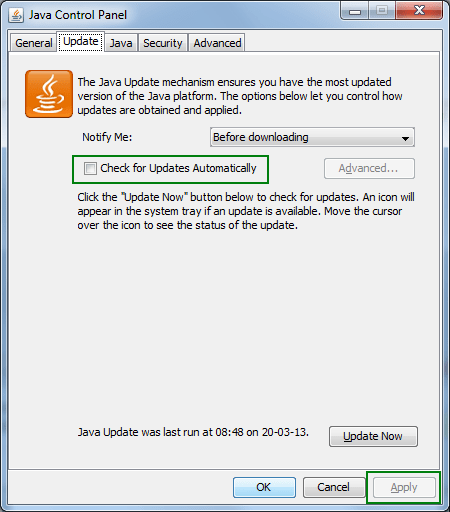 So I decided to disable the automatic update feature that comes with Java. 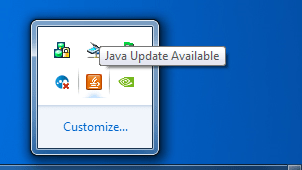 Soon after I was presented with another popup box, telling me that Java needed to update (again). I thought maybe I didn’t uncheck the box, and was met by a checked checkbox, when I opened the property page. I unchecked it, and was asked if that was what I really really wanted, and clicked yea to that. So, back to work… At least for a little while. The same popup was once again presented, and this time I was certain I had unchecked. When I opened up the property page, I was once again met by a checked checkbox. WTH! The screendumps below show how I click the property pages, on the icon in the tray. I then get the property page, where I’m met by the checked checkbox. And then some magic happens. Because when I open up the property page once again (w/o doing anything else on the system) I am met by a checked checkbox. How do you sleep at night you “&%¤§#”&%/ crappy programmer! Jens I feel your pain!!!! I have now sent a letter to the Danish Consumer Ombudsman, as I believe the methods used by Oracle in pushing the Ask Toolbar et al, are quite illegal in Denmark. I hope they will do something about it – anyway it shall be interesting to see what will happen in the case. My letter can be found here (Danish).